The very first theme of 2019 for I Heart Cooking Clubs is A NEW START! Shouldn’t we all be getting more veggies into our diet, taking our lunch to work, baking our own bread. 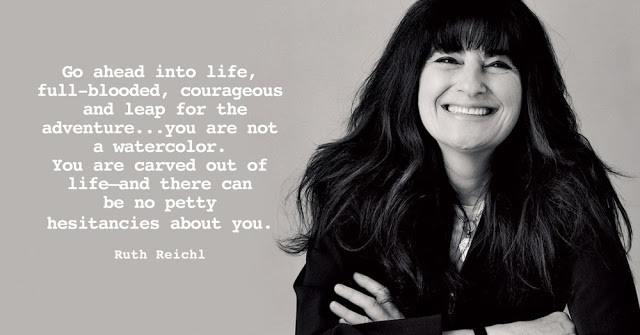 We were challenged this week to make any Ruth Reichl recipe to celebrate a new start in the kitchen. Here’s to making life simpler in 2019, enjoying what we have, celebrating family, and enjoying each other with special dinners for two. Preheat oven to 375 F. Rub the potatoes with a bit of olive oil and sprinkle with sea salt. Place potatoes on a baking sheet and bake for about 45 minutes or until soft. While potatoes are baking, clean and shred Brussels sprouts. Dice the onion. Add a bit olive oil in a medium skillet, toss in onion and the smashed garlic. After they grow fragrant, season with salt and pepper; add some chile flakes and the miso. Stir. Toss in Brussels sprouts and stir, cooking about 5 minutes or until wilted. Season the chops with salt and pepper. Heat more olive oil in a hot cast iron skillet. Allow chops to get a good crust on the outside while remaining bright pink within (about 4 minutes a side). Remove to a platter to rest. 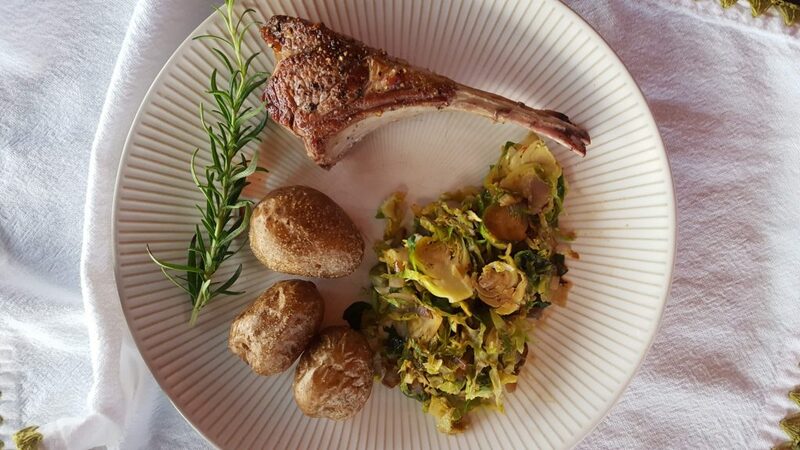 While the chops rest, sprinkle the Brussels sprouts mixture with the maple syrup and soy sauce. *Instead of russet potatoes, I used some baby potatoes that I had on hand. I also used the food processor to shred the Brussels sprouts. As with many a Reichl recipe, this one was written in narrative form with a “bit of this” and a “bit of that.” I wrote out the instructions in a traditional manner above. I thought I would love the Brussels sprouts more. I might increase the red chili flakes a bit more next time. They were still good; don’t get me wrong. There’s also a LOT of them. I will be having Brussels sprouts for lunch tomorrow (and Tuesday and Wednesday). This meal took us about 30 minutes to prepare. (Our tiny potatoes took only 20 minutes to roast.) This recipe will be in our weeknight rotations. I’ve cancelled our Blue Apron subscription and hope to create my own meals for two like this one in quick and easy and healthy fashion. We’re going to try to have more meals at the kitchen or dining room tables…not eating in the car, grabbing something on the run, or (sigh) eating in front of the television. Healthy is going to be a key for us—more veggies. In fact, I just heard that “flexetarianism” is the next big thing for 2019. Please help monitor us to keep us on track. Check out next week’s IHCC (and the weeks after) here. Join us for 2019! For all my IHCC posts, click here. Love the quote you’ve chosen to set the tone for the New Year. Celebrate quiet time with family for a special dinner can never get old. Love the philosophy behind this post! And what a great dish — I love Brussels sprouts, but a pound is a LOT for two people. I’d probably stir the leftovers into a frittata. Anyway, good stuff — thanks. Lamb chops and roast potatoes are a wonderful treat. Your chops look like the super-expensive kind. We buy loin chops at Costco where they are a pretty good price, and still extremely high quality — in fact they are sourced from the same Australian suppliers as the more expensive supermarkets. I’m not a big fan of brussels sprouts, but that looks like a decent way to cook them. I prefer broccoli — better taste, same health benefits. I need to buy some lamb chops and try this. It sounds really good. Reichl is one of a king and I almost always like her recipes. Thanks for sharing! I always think of lamb chops as a special meal and your entire meal sounds special to me. Grilled lamb chops is a standard for us during grilling season, but we normally don’t have it otherwise and I don’t know why. Of course you can cook them in a skillet. Thanks for waking me up to that. 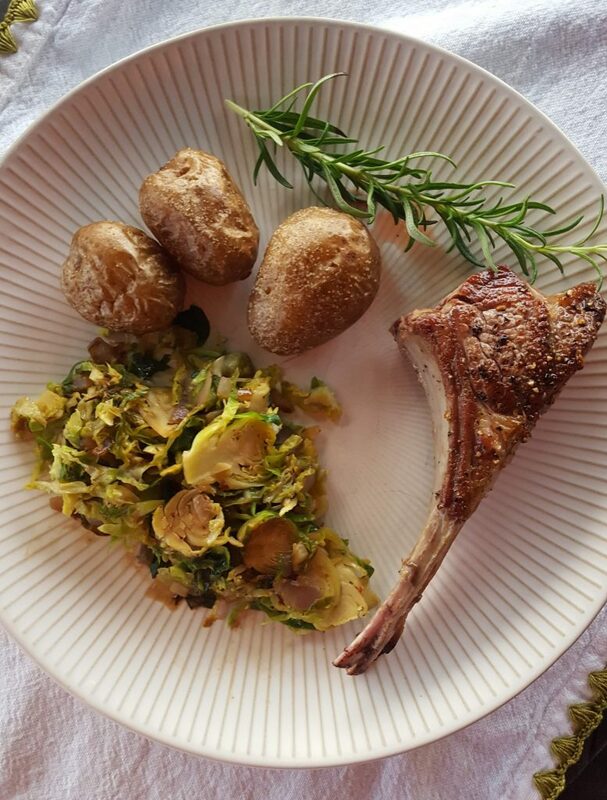 Your plate has me craving lambs with potatoes and Brussels sprouts! I love the quote you shared about slowing down and enjoying a quieter and special meal at home. It’s hard to think of anything more special than lamb chops. They are certainly a special splurge item at the grocery and oh so delicious. This whole meal is beautifully plated and looks absolutely delightful! Gorgeous and delicious way to start the year!